The true value of our service is reflected in the comments and letters we receive from other commercial real estate brokers. 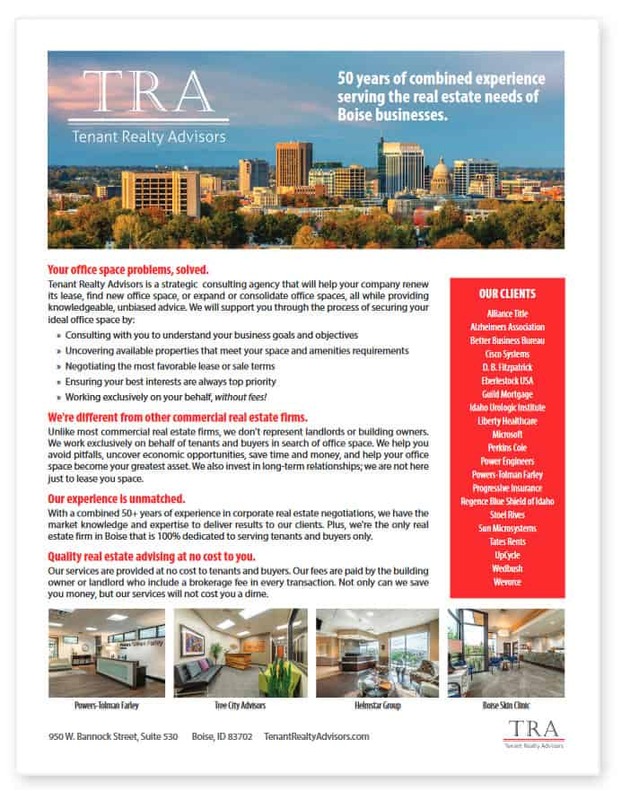 Tenant Realty Advisors has had the pleasure of representing and working with major commercial firms around the country on their local requirements. "Through his knowledge of the local real estate market and the area's various landlord motivations, Greg was able to provide significant leverage thereby allowing us to negotiate the terms we needed in this location. Greg spent considerable time on the ground and on the phone working through solutions for each deal point. He even went so far as to manage the installation of some carpeting the local office needed! Greg is a great partner and I would not hesitate to recommend his services!" "Our office works with corporate clients that have office locations throughout the country. Of course, having established these corporate client relationships over many years, we don't take an outgoing referral lightly. We have trusted Greg with 3 requirements in the Boise area over the past 5 years. In each case, he has handled the assignment with the utmost in professionalism, integrity and efficiency. The end result in each case was a job well done and a satisfied client."